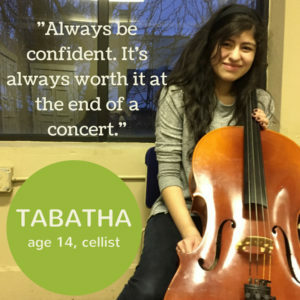 Tabitha, age 14, decided to learn the cello because she looked up to Ariana, and playing the same instrument as her was really cool! 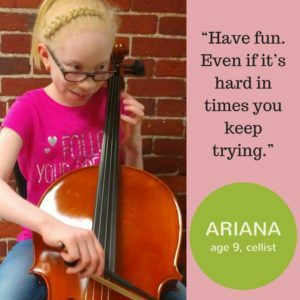 She likes playing the cello because of the super low notes and is learning to pay attention to intonation so she can fix her mistakes quickly. She wants new musicians to remember to always be confident because it’s so worth it when you finish a concert. 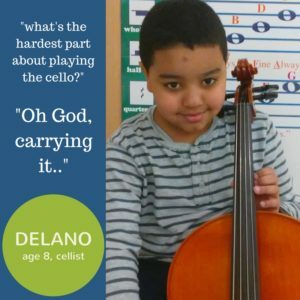 Delano , age 8, is a budding cellist. He chose it because of how big it was, but to his dismay, it turned out to be really heavy. Although, the size “makes it easier to do the pizzicato”. 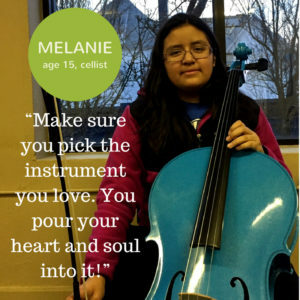 The hardest part of playing the cello? “Oh God. Carrying it,” Delano says. Delano has been playing for three months and loves playing his own songs.